AncestryProGenealogists is the official research division of Ancestry.com and has provided research for all of the Who Do You Think You Are? episodes. As genealogists we focus on identifying our family amid the mass of humanity surrounding them. At times having a narrow focus serves us well. For instance, it was extremely important when searching for Chris’s ancestor John McGuire to find the correct John McGuire in British military and local Irish records (rest assured, there are a lot of John McGuires in Ireland). However, it is also important to take a step back to gain a broader perspective of the world surrounding our ancestors. The history of the time and place they lived in often helps answer the “whys” that we encounter in our family research. 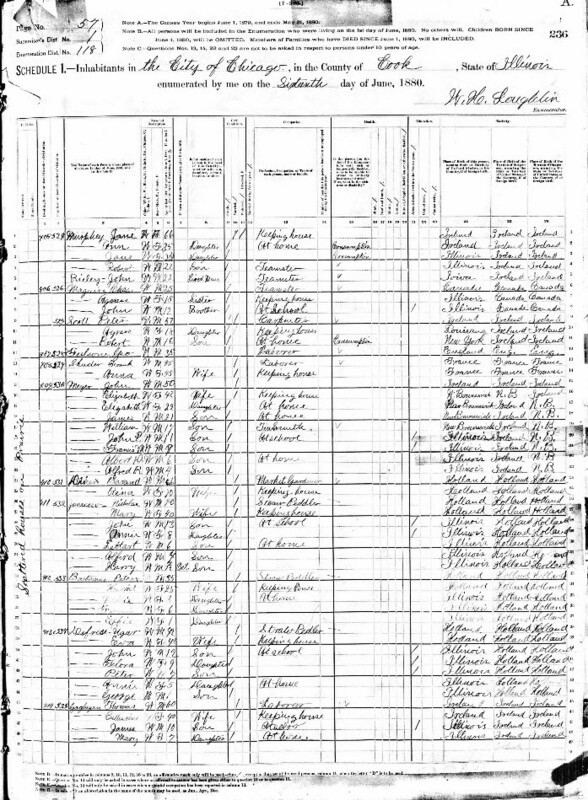 This was the case as Chris Noth tried to determine why his ancestor Charles McGuire was the head of household in the 1880 census, with his two minor siblings in his household. What happened to his parents who appeared with them just 10 years earlier? After scouring death records, newspapers, city directories, personal accounts of the Great Chicago Fire, and Catholic Church records for the entire extended family, we finally had to acknowledge that we may never know exactly what happened to Dennis McGuire or why Ann did not live with her children. However, by comparing details from these records with maps of Chicago we were able to confirm that the McGuires did live in an area that was utterly decimated by the fire. Although we have no known personal accounts written by the McGuire family, the archives and libraries in Chicago hold a myriad of maps, pictures, and personal accounts of the fire and the experiences of those who lived in its aftermath. We made extensive use of the archivists, librarians, and historians in the area to better understand the experience of the McGuire family. Don’t be afraid to pick up the phone and talk with the local archivists, librarians, and historians. They are experts in the local holdings and can help you discover the historical background you’re looking for. Even when you feel flush with records, a broader historical perspective will provide insight that you cannot glean from the records of your family alone. 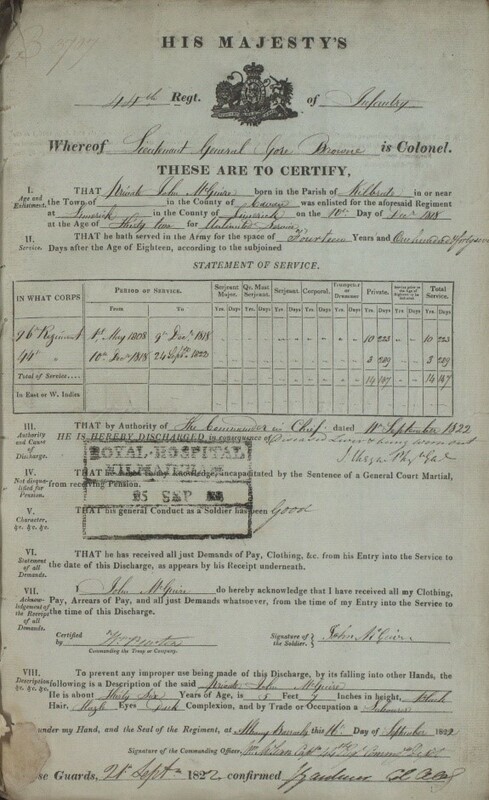 If your ancestor was a member of the British military, like John McGuire, be prepared for a wealth of information. There are pay lists, muster rolls, enrollment records, pension records, and medal award rolls―to name just a few. In the case of John McGuire, the paper trail for his military service is quite long (95 documents and counting). Each of these documents provides a piece of the story, but it is only as these records are included in the context of history that his story comes to life. Although city directories are not as detailed as census records, since they were published every year, they can provide information about a person’s location and occupation from year to year. It was common for residents of large cities to move frequently, so don’t be surprised if you see your ancestor move to a different address every couple of years. If you are having a difficult time finding your ancestor in the city directories using the search feature, try browsing through the city directory for the particular city and year of interest. Military records frequently lack the details that help us identify our ancestors, such as birth date, birthplace, and names of relatives. If you find yourself struggling to identify your ancestor in military records, look for mention of his military service in records created later in life when he can be located with his family. Pensions, obituaries, tombstones, and other burial records are a great place to learn details about the regiment in which a veteran served. Tracing your ancestors back to a specific location in Ireland can be a challenge. Don’t give up! Look at all records that you can find for your ancestor, their family, and all of their close associates. Here a few places that you should look: church records, obituaries (including Irish ethnic newspapers), burial records and tombstones, censuses, naturalization records, and Irish organizations. Learn more about Chris’s journey or watch episode recaps from previous seasons on TLC.com. 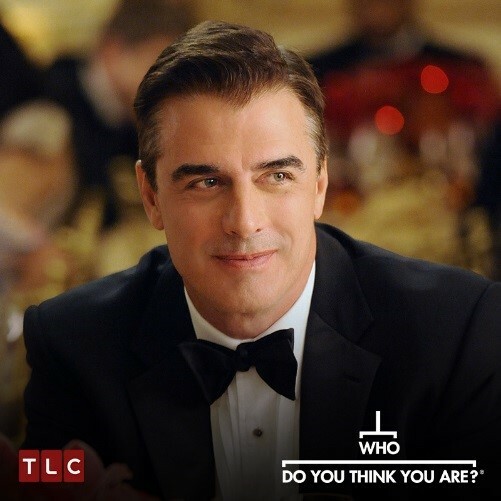 Watch more celebrities discover their family history on all-new episodes of Who Do You Think You Are? Sundays 9|8c on TLC. Kathryn was introduced to family history for the first time when she was 15 years old, and she fell in love with it right from the start. Prior to joining ProGen, she owned her own genealogy research company. She loves to teach and has taught genealogy courses at various conferences throughout California and Utah. Kathryn has a bachelor's degree from Brigham Young University and completed additional training in American research at the National Institute of Genealogical Studies and the Salt Lake Institute of Genealogy. She also completed advanced training in DNA and adoption/unknown parentage research at the Forensic Genealogy Institute and Salt Lake Institute of Genealogy. She loves helping her clients connect to family that was previously unknown. During her time with ProGen, she has had the opportunity to work as a lead researcher for the Who Do You Think You Are? and Long Lost Family television shows. Her areas of research expertise include genetic genealogy, adoption/unknown parentage research, United States (emphasis on Midwest, Mid-South and Mid-Atlantic), and immigration research.